Deep in the Indonesian rainforest on the island of Java roam the last of earth’s most critically endangered large mammal species: the Javan rhinoceros. Once Asia’s most widespread rhinoceroses, these secretive forest-dwellers disappeared altogether from the continent’s mainland in October 2011, when the last individual was found dead in Vietnam with its horn chopped off by poachers. A single population of just 40 rhinoceroses survives in the western half of Java’s Ujung Kulon National Park, cramped into a corner of the island that has reached its carrying capacity. 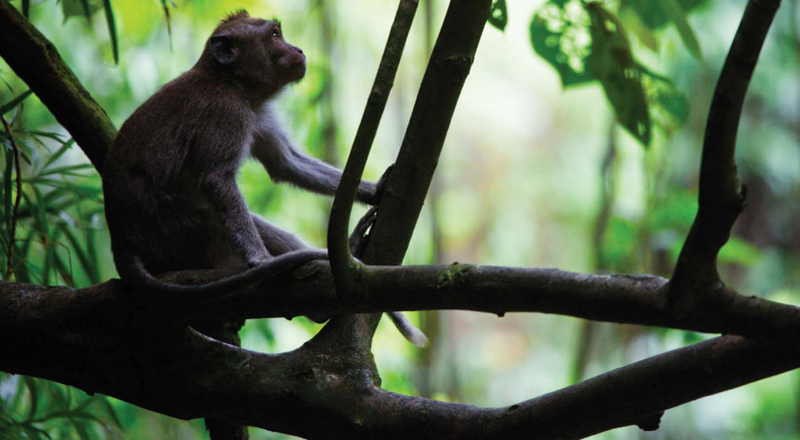 The Indonesian government recently endorsed a daring plan to expand the range of their emblem species by establishing a second population with more room to grow. Yet a major concern remains. 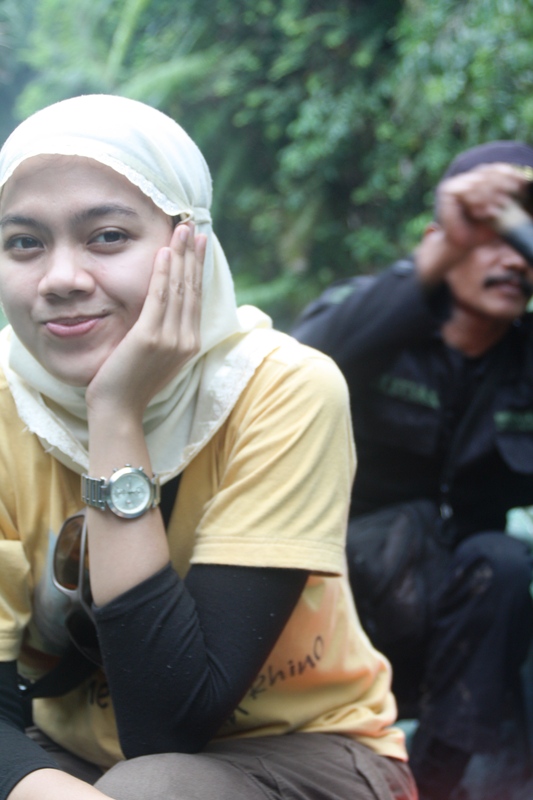 The plan involves moving some rhinoceroses from the isolated westernmost tip of Java to the eastern side of the park—an area surrounded by 19 agricultural villages whose inhabitants rely on water buffalo to work their rice paddies. No fences limit the wanderings of these loosely managed buffalo, which regularly pass into the park and could spread diseases that would quickly decimate the rhino’s population. Cornell postdoc Dr. Kurnia Khairani has received a Fellowship Training Grant from the Morris Animal Foundation to address this problem. 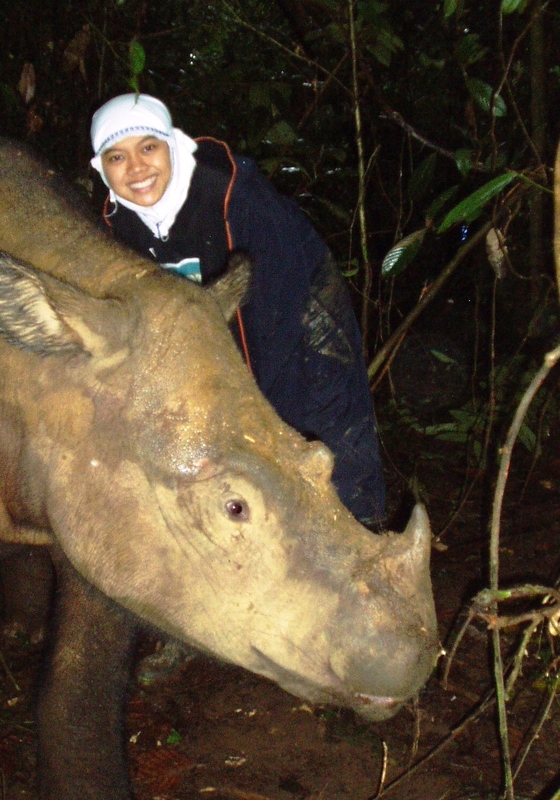 With the help of faculty and students at the College of Veterinary Medicine, Khairani is combining fieldwork in Indonesia with labwork and training at Cornell to improve the health and outlook of Javan rhinoceroses. It is the first time an Indonesian has received this prestigious award, and the first time a Cornell fellow will be trained in conservation medicine. A postdoc in the laboratory of immunologist Dr. Julia Fellipe, Khairani will work under the joint mentorship of Fellipe and Radcliffe. Additional mentorship from epidemiologist Dr. Daryl Nydam and microbiologist Dr. Pat McDonough will round out Khairani’s skills. Conducting a preliminary health survey of village buffalo, Khairani found several diseases of concern to rhinoceroses, including blood parasites, salmonellosis, and leptospirosis. With highly infectious diseases such as SARS, West Nile Virus, and Avian Influenza making worldwide headlines for crossing species barriers and ecosystems, it is critical to get this historic move of the rarest rhinoceros right the first time. 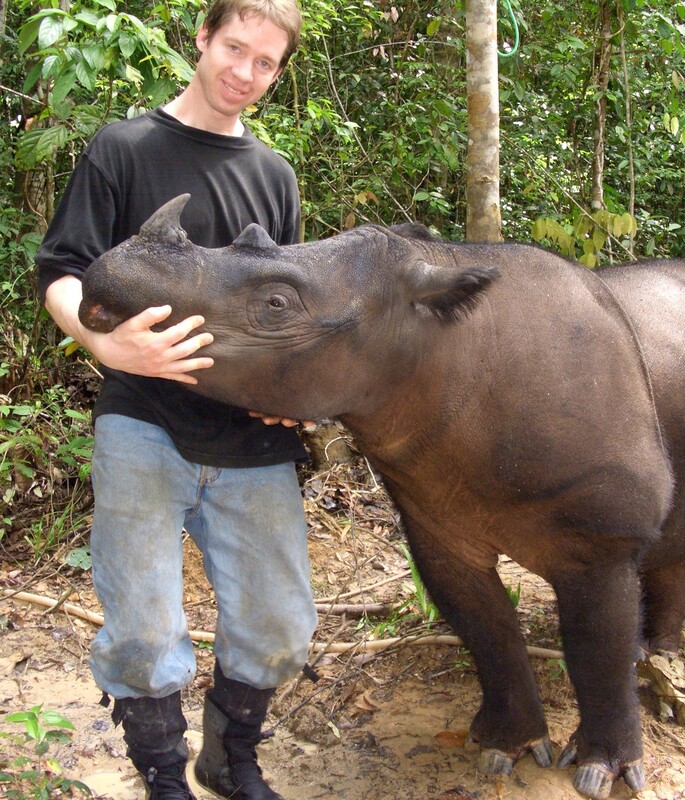 Khairani’s ongoing survey will focus on hemorrhagic septicemia, a bacterial disease linked to four recorded die-offs of Javan rhinoceroses in the region. Khairani will determine the prevalence, distribution, and risk of contracting septicemia faced by the buffalo population; conduct questionnaire-based interviews with buffalo owners to determine management factors that might contribute to the regional epidemiology of the disease; and propose possible interventions. The project also involves outreach, educating local public health officers and villagers on septicemia diagnosis and management through hands-on training. It has also opened doors for Cornell veterinary students to gain valuable hands-on international experience, and several have already conducted internships in Indonesia with Khairani through Cornell’s Conservation Medicine Program with funding by Expanding Horizons. For four weeks this past fall over two dozen dairy veterinarians converged on a private farm in Sanhe City, 37 miles east of Beijing. Here in China’s Heibei province, the Cornell University College of Veterinary Medicine has partnered with Huaxia Dairy as well as local Chinese educational, government, and agricultural institutions to lead an international collaboration that is benefiting animal health and food safety in China and beyond. Cornell China Dairy Institute has provided hands-on continuing education to approximately 70 Chinese veterinarians and veterinary technicians since its launch in September 2010. During the four-week program, participants from across China attend morning lectures at Sanhe City Vocational Education College followed by afternoon hands-on training at the Huaxia Dairy farm taught by Cornell veterinarians, veterinary students, and lab technicians. Revenue from the program goes to support the College’s local dairy programs in New York State, including food-animal externships and the highly successful Summer Dairy Institute on which the China program is based. Tailored to meet the current needs of the veterinary community in China, content integrates topics such as how to care for sick or injured cows, calf health and heifer-raising, dairy reproduction, and techniques for ensuring high quality milk production. 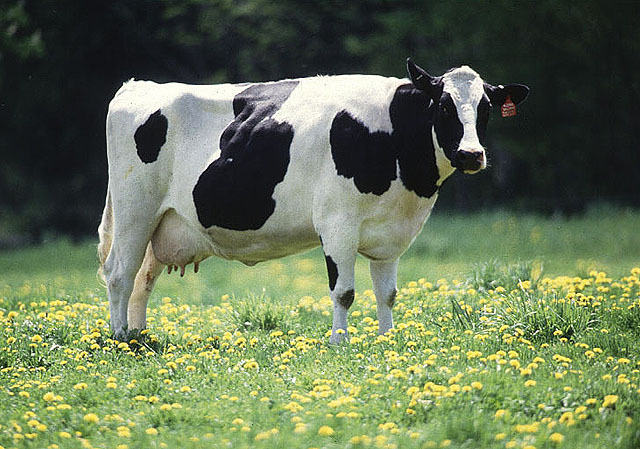 The timing is right for this type of initiative, according to Charles Shao, CEO of Huaxia Dairy Farm, who explained that China’s dairy industry is presently in a growth phase. The program also supports goals outlined in the College’s strategic plan, including finding opportunities to influence the standards for veterinary practice followed around the world and providing teaching opportunities for Cornell veterinary students who may be interested in a career in academia. Josh Boyden ’12 spent two weeks in China as a teaching assistant in October 2011. This year’s teaching team also included teaching assistant Karen James ’12; PhD student Dr. Soon Hon Cheong; alum Dr. Mark Thomas ’97; and Drs. Lorin Warnick, Charles Guard, Daryl Nydam, Robert Gilbert, Rodrigo Bicalho, Gary Bennett, and Michael Zurakowski. Support for the Cornell China Dairy Institute comes from student tuition, Huaxia Dairy, Pfizer Animal Health, the U.S. Grains Council, Alta Genetics, Land O’ Lakes, Sanhe City Vocational Education College, and the Sanhe City government. Modern American livestock farmers face two emerging challenges: an increasing shortage of large-animal veterinarians, and dimming public understanding of what happens with food before it hits the fork. A new reality documentary series called Veterinarians on Call seeks to bridge these gaps by offering online viewers a candid look into the work of real livestock veterinarians, raising awareness of the care that goes into responsible livestock farming in the US. As part of its efforts to support the veterinary and animal health industry, pharmaceutical company Pfizer funded the show’s production. Currently seven short ‘webisodes’ are available through the show’s Youtube Channel. Each episode follows one of several livestock veterinarians selected from various states and specialties who have volunteered to be filmed in their day-to-day work behind the scenes caring for food-production animals. Cattle veterinarian Dr. Peter Ostrum ’84 features prominently in the series. Ostrum had an early start onstage playing the role of Charlie in the classic film Willy Wonka and the Chocolate Factory (1971). Preferring farms to fame, he left acting to earn his DVM from Cornell and now works at a mixed animal practice in upstate New York, which he co-owns with three other Cornell alumni. The show highlights how veterinary care plays into the key concepts of animal welfare and food safety, and reveals aspects of the job Ostrum says people wouldn’t normally think of. “This job is not just treating sick cows. A lot of it is education; we spend a lot of time with people, training the farm workers who work with these animals every day and are usually the ones making decisions about treatment,” said Ostrum. When John W. Whitefield ’65 passed away in 2004, his colleagues and friends began raising funds for a scholarship that would keep his memory alive through generations of students who would receive the award. Through the work and creativity of some of his closest friends, including fellow alumni Dr. Ed Dalland ’68 and Dr. Joel Edwards ’64, the scholarship fund recently reached $100,000 with more than 350 donations from friends, family, colleagues, classmates, and clients. “John was a good friend of mine and when he became ill I recruited a number of Cornell alumni to form a fundraising committee headed by Joel Edwards to establish the Whitefield Scholarship,” said Dalland. “We wanted to honor John while he was still alive, and he was very humbled. We mailed brochures to all practicing veterinarians in New York State letting them know of our efforts and asked veterinarians to give their clients the opportunity to contribute, especially those with pets on which John had performed surgery. The John W. Whitefield ’65 Memorial Scholarship will be given every year in perpetuity. The minimum for scholarship endowments at the University and College is $100,000, which provides annual support in perpetuity to qualifying students. Scholarships may be named for individuals, animals, or beloved faculty members and provide much-needed assistance. If you are interested in establishing a scholarship or know of individuals who might be, contact Amy Robinson in the Office of Alumni Affairs and Development at amy.robinson@cornell.edu. In September 2011 Dr. Christopher R. Byron BS ’94, DVM ’98 was appointed assistant editor for the Journal of the American Veterinary Medical Association (JAVMA) and the American Journal of Veterinary Research (AJVR), premier veterinary science journals published by the American Veterinary Medical Association. Byron’s appointment is the latest in a string of varied professional experiences as a young equine surgeon. After earning both his undergraduate and veterinary degrees at Cornell University, Byron interned at the Rood and Riddle Equine Hospital in Lexington, KY. He then completed an equine surgery residency and master’s degree program at Michigan State University, becoming a board-certified diplomat of the American College of Veterinary Surgeons (ACVS) in 2003, on whose Resident Credentials Committee he now serves. As an Assistant Professor of Equine Surgery at the University of Illinois for six years, Byron taught veterinary students and residents, practiced clinical equine medicine, and headed a research team publishing papers about shock wave therapy and equine joint disease, including several in JAVMA and AJVR. He then joined the staff of the Ruffian Equine Medical Center, a private equine referral center in Elmont, NY, where he practiced equine surgery until March 2011. Experience on the review board of the ACVS Veterinary Surgery journal prepared him for his full-time position in Schaumburg, IL. As assistant editor for AVMA’s publications, he will read and review article submissions and prepare them for release to JAVMA and AJVR’s subscribers, informing the veterinary community about the latest developments in veterinary science and clinical innovations. From the stray-strewn streets of Trinidad and Tobago to cow-covered pastures of rural New York dairy farms, Miguella Paula-Ann Mark-Carew has journeyed far in her quest to understand and combat disease epidemics across the world. Ever since she came to Cornell’s College of Veterinary Medicine through a veterinary summer program when she was 17, Mark-Carew wanted to return as a full-time student. While attending Dartmouth College, she spent two respective summers conducting epidemiological research with Drs. Paul Bowser and Ted Clarke, and her positive experiences with Cornell faculty further sealed her aspiration. In 2007 she came to Cornell’s College of Veterinary Medicine as a doctoral student in the field of comparative biomedical sciences. An aspiring epidemiologist, Mark-Carew studies Giardia parasite infections at the group and population levels to help understand and control potential epidemics. Giardia protozoa infect the small intestine of humans and other animals, causing stomach pain, diarrhea, bloating, fever, nausea, and vomiting for two to four weeks. It commonly spreads via water contaminated by raw sewage or animal wastes. It can also spread between individuals, quickly putting populations at risk. Mark-Carew’s Giardia studies took her from the New York Watershed to the islands of Trinidad and Tobago to study the parasite’s prevalence and genetic makeup in dairy cattle and other mammals. After receiving a Fulbright grant funding an independent epidemiological project, Mark-Carew returned to the Caribbean state of Trinidad and Tobago to take on a growing health concern facing her family’s homeland. Her Fulbright project involves efforts to quantify, manage, and control the population of thousands of stray and free-roaming dogs in streets across the country. These dogs can carry Giardia and other diseases humans can catch, posing a serious potential public health risk, according to Mark-Carew. Beyond its medical and epidemiological significance, the project involves sociological surveys with political potential. Mark-Carew interviews residents and tourists about their perspectives on several concerns, including stray dog issues, testing to identify parasites, and the value of continuing her efforts to count the number of strays, all with the hope of inspiring policy changes to address the stray problem. Mark-Carew has also been involved with a project called “Caring Collars Loving Leashes” that was started by her mother, Marlene Mark, to promote the human-animal bond. Inspired by a talk Mark-Carew gave at Cornell about her project, five Cornell students have visited Trinidad and Tobago to lend a hand. Sophie Tilitz, a rising freshman undergraduate interested in animal science, helped for six weeks from February to April 2011. In January 2011, second-year veterinary student Jasmine Bruno and third-year students Sarrah Kaye, Erin Lashnits, and Sarah Dumas spent two weeks on the islands with Mark-Carew collecting parasite samples from dogs, cattle, and water buffalo, processing samples in the lab, counting roaming dogs in the streets, and volunteering in an intensive marathon spaying and neutering event. Mark-Carew hopes her career will allow her to assist the World Health Organization or similar entities to navigate an increasingly globalized world through which pathogens can spread quicker than ever before. She aims to understand how diseases differ across the world and species and hopes to work on projects concerning public health and animal health, particularly dealing with waterborne diseases in developing countries. The maned wolf, native to southeast South America, a near-threatened species, is one of the kinds of animals that students in the new Cornell-Smithsonian joint graduate program may address as they learn to become wildlife conservation scientists. At a time when extinction threatens nearly one-quarter of all known vertebrate species, Cornell and the Smithsonian Conservation Biology Institute (SCBI) have teamed up to offer a new shared doctoral program that will train the next generation of wildlife conservation scientists. The Cornell-Smithsonian Joint Graduate Training Program (JGTP) began accepting applications this month to train students who will leverage basic research at Cornell with conservation initiatives pioneered by one of the nation’s pre-eminent wildlife research institutes. Using the facilities, resources and expertise at both institutions, students will learn to become independent investigators equipped to study and preserve some of the rarest species on the planet. Students in the five-year program benefit from the dual mentorship of a Cornell faculty member and an SCBI staff scientist. Collaborative research projects will utilize resources in Ithaca and SCBI campuses (in Front Royal, Va., and Washington, D.C.), allowing students the opportunity to work with advanced biomedical facilities at Cornell and endangered species populations such as cheetahs, clouded leopards, cranes and oryx at SCBI. Jennifer Nagashima, the first student admitted in the Cornell-Smithsonian Joint Graduate Training Program during last year's pilot phase, studies canine reproduction. Jennifer Nagashima, the first JGTP student admitted during last year’s pilot phase, for example, works on canine reproduction. She studies aspects of female reproduction at SCBI, where she works on in-vitro egg maturation and fertility synchronization. In the Travis lab, she is learning new technologies to preserve genetic resources of male animals using spermatogonial stem cells. She’s also synthesizing both lines of training in studies on assisted reproduction techniques such as in-vitro fertilization and embryo transfer. She has rounded out her studies by delving into how hormones control the canine reproductive cycle with Ned Place, a reproductive endocrinologist at Cornell. Carly Hodes is a writer at the College of Veterinary Medicine.